1) Show the truth, show character, show originality Unlike most of my schoolmates I somehow escaped my teenage years without ever having worked at McDonald’s. For a shy artsy geek the prospect seemed daunting, if not downright depressing, almost as if I would be ‘selling out’ if I lowered myself into the dead-end grease pit of Macca’s cashier service. 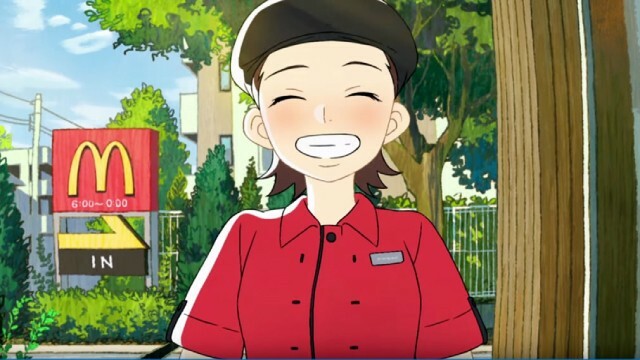 I’m guessing my opinion would’ve been drastically different had I been shown this recruitment anime from McDonald’s Japan. Okay, so it’s clear I’m a bit biased in my love for this recruiting video series, so let’s break down why. First, the thing that makes these videos great is that the job is not presented as an end unto itself, but as a stepping stone in the characters’ greater lives. It’s a place for the trainee to gain confidence, and a place for the manager to gain skills to move into higher level positions. It rings of truth much more than a video trying to claim that an entry level position at a fast food company is the be all and end all of success. Second, there’s a genuine personality in the characters and a rapport evident between them. Some corporate videos can benefit from keeping characters non-specific so as to reach different audiences, but others like this benefit from the warm likability of the fictional girls. And third, this recruiting video stands out largely because it doesn’t feel like a recruiting video at all, but more like an episode of a lighthearted anime series. Yes, that’s right: your recruiting video does not need to feel like a recruiting video. It doesn’t even need to feel like a corporate video at all. You can, in fact, make something creative, beautiful, and charming and – gasp – people will still watch it. 2) Why so serious? Show some self-deprecation There’s something about coming up with corporate video ideas that makes otherwise funny, interesting and intelligent people lose their damn minds and become a mess of bland bureaucracy. This happens for a couple of reasons: 1) Many corporate videos try to target very broad audiences with very varying tastes in humour, resulting in a watered-down version of everything, 2) Too many cooks in the kitchen causes a clashing mishmash of style, and/or 3) The immediate assumption is that the only audience you could possibly be making a corporate video for is some investment banker in a business suit – someone who could never share your actual sense of humour – someone who categorically isn’t you. So the recruitment video script stays in some kind of fantasy land where you’re afraid to say anything too real or too negative, speaking to a guy who doesn’t exist and an audience too vague to engage. Fact of the matter is the best thing you can show when making a recruitment video is some good ol’ self-deprecation. In the same way the McDonald’s anime feels like a tv show, Twitter’s ‘Join The Flock’ campaign feels like a comedy sketch. But instead of poking fun at Twitter jobs themselves or at their competitors, it instead pokes fun at cringey recruiting videos by pretending to be one itself. A play within a play, as it were. 3) Show discernment What is your selling point? Company culture, rewarding work, a mission statement you actually believe in? In a recruitment video the company itself is the product, and the most important task is to determine your strongest suit from an employee perspective. Focussing on one single suit will help avoid the biggest pitfall: trying to overhype a bad selling point. If you’re a regular to the Explanimate blog you may have seen our article on The Most Awkward Government Ad Ever, detailing how different stylistic choices could have saved the Department Of Finance’s cringeworthy recruitment video. The problem was a bizarre script and wooden acting trying to sell the behind-the-scenes culture in the Department of Finance as fun and ‘game changing’. What might’ve helped even more is to pull back from the catchphrase concept of ‘game changers’ and look at selling a different point. Some ideas: The real life effects of what work in the Department Of Finance actually achieves – a more realistic ‘day in the life’ video with a focus on the little joys employees find in their finance work – even a tangential look at the humans behind the finance as seen through the eyes of their desktop staplers. You’re welcome, Department Of Finance. The company is the product It goes without saying the job market is tight. If you need a job, your first step is to take a look around on job boards to see what’s on offer (if anything). Headhunting workers straight out of university is a much rarer occurrence now than it once was, though not unheard of by larger companies. The big idea behind recruitment videos these days is less about nabbing specific workers and more about planting the early seeds of positive brand recognition within a professional sphere. Do it well and you’ll have fans (and possibly a future workforce) for life.